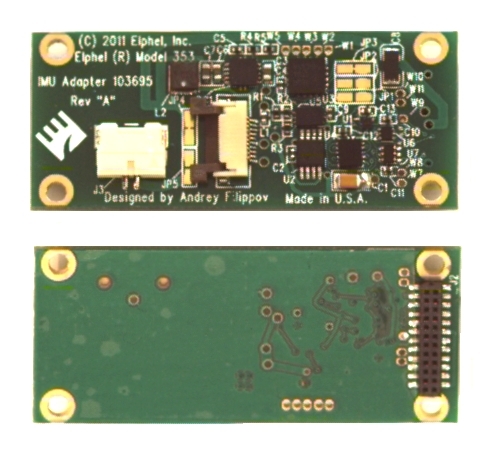 103695 is an adapter board used to connect Analog Devices Inertial Measurement Units (IMUs) to Elphel products. Adapter uses two general purpose I/O of the camera FPGA available on each of the USB/extension connectors. The 103695 board provides 3.3V/5.0V power to the IMU (selectable by on-board resistors) and supports different speed SPI interface to the sensor unit. The device connector (J2) can accommodate a number of Analog Devices units, it should be possible to use the board with connector adapter with other SPI sensors. Camera interface to the 103695 board is implemented in the FPGA (starting with firmware revision 8.1.0). Up to 28 different 16-bit registers (plus 8 bytes of the timestamp with 1 microsecond resolution) are periodically addressed, read and stored in the camera system memory over the DMA channel. The The logged register addresses are programmed at run time in the FPGA using the device driver. NOTE: All IMUs have compatible interface and most likely will work with Elphel products.